Each of the past few years, it has seemed that I get a slow start to my Christmas. In some years, there are more weeks between Thanksgiving than others. And in those years, a slow start is not such a big deal. But this year, it was one of the short spans between Thanksgiving and Christmas and I got behind really fast. It's no fun when you finally really get into the spirit and it's too late to do much about it. Next year I think I'll have to make an effort to get the tree down the day after Thanksgiving and force myself to start. 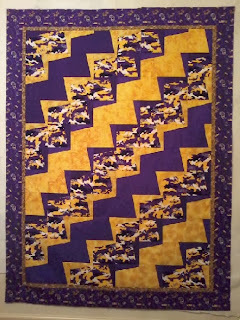 Finally got the LSU quilt for my secret pal gift finished and to her. 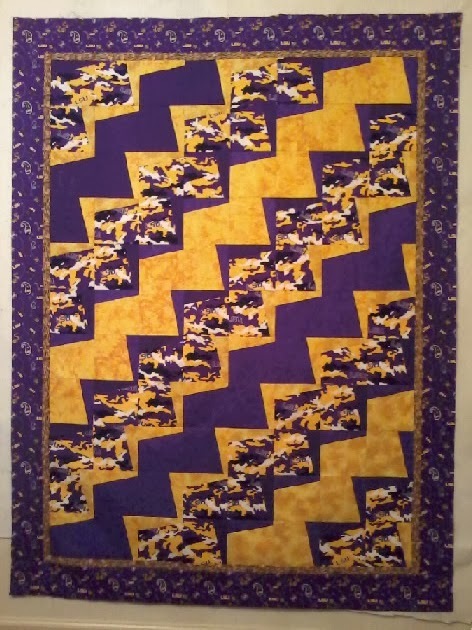 I have been dying to show it at my quilt guilds but I couldn't because she is always there. She really loved it and I am so glad. So what do you think? Mom and I are working on a last minute quilting present. Should be finishing it off today. Have to sneak around about it because we can't be seen. Can't believe that Christmas is only three more days! Tomorrow, we'll be taking my brother Mike out to dinner for his birthday. He was born on Christmas Eve. We figured it would be kind of hard to find a place on Christmas Eve. My brother Mike and my Uncle Vance are both Christmas Eve birthdays and my grandfather was a Christmas Day birthday, so when we were growing up, we always had a birthday party on Christmas Eve. Finally got the border (sort of) on that "If You Build It" quilt. I need to get it finished as well. What do you think of how I finished off the pinwheels? Well, now that Lizzie is back, I've been "busy as a bee in a tar bucket". 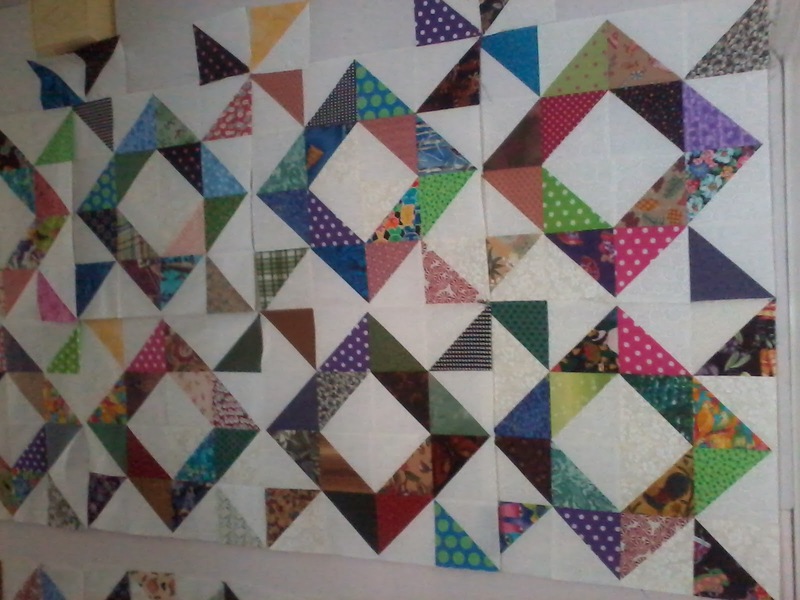 I have quilted 5 quilts in the last 4 days. And one of those days, I didn't do anything at all. I have 3 more to go to be all caught up for now. Two of them are missing backs and one is a modern quilt that I really don't know how to quilt yet, so they are on the back burner for now. 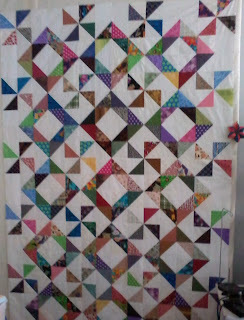 I've been doing a block here and there on my scrap quilt and it is coming along. I absolutely love it. Can't wait to see it finished, but trying to enjoy the journey. Christmas party this evening for one of my quilt guilds. We are meeting at Parrain's Seafood Restaurant. Good Food! Good Friends! Good Times!